When you want to divide your browser window into sections, In this situation, you can use HTML Frames. With the help of HTML Frames, browser window can be divided into multiple sections where every section can load a separate HTML document. 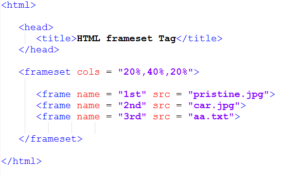 Note − The <frame> tag is deprecated in HTML5. Do not use this element. When you are using more than one frames, then its know as a frameset. In this case, You have to use <frameset> Tag. 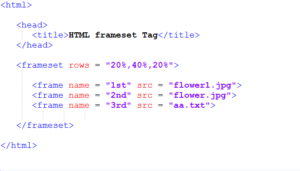 For using frames on a web page, you use <frameset> tag instead of <body> tag. 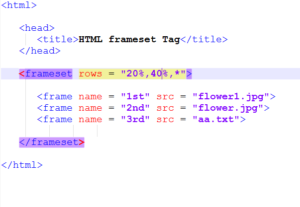 The rows attribute of <frameset> tag defines horizontal frames. Each frame is indicated by <frame> tag and it defines which HTML document shall open into the frame. The cols attribute of <frameset> tag defines vertical frames. Each frame is indicated by <frame> tag and it defines which HTML document shall open into the frame. In the Following example, the First frame section is 20%, the second frame section is 40% and “*” indicates rest all. An iframe is an inline frame in the HTML element that allows you to an external webpage to be embedded in an HTML document. Here, In the following example, we embedded a map in the iframe tag. rows Specify how many rows are contained in the frameset and the size of each row. cols Specify how many columns are contained in the frameset and the size of each column. framespacing specifies the amount of space between frames in a frameset. src Specify Source File to frames. Hope you enjoyed reading the blog post. Let us know if you have any suggestions for the published content on the site. 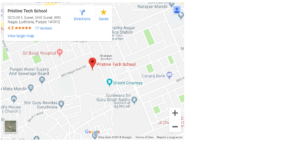 Feel free to contact us if you wish to register yourself in our skill upgradation courses.